This pattern is available from yarn.com for $4.99. 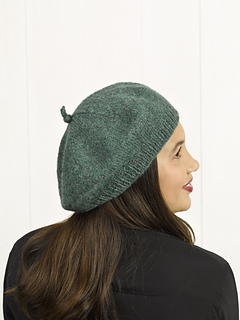 “My needs are simple: I’m always happy with the very best.” Valley Yarns Nieve is an on-trend beret featuring a narrow ribbed band and gored crown, and is worked in one piece from the band to the top, with an I-cord knot as a finishing touch. Valley Yarns Peru is a spectacular blend of baby alpaca, merino wool, with a hint of nylon that works beautifully into cowls scarves, shawls and sweaters. A yarn with a chainette construction, you’ll get a warm, lightweight fabric from Peru that has a gorgeous drape.